Scientists have recently identified several substances called nootropics – natural ingredients proven to boost brain activity and provide a wide range of mental benefits. Cerastim is a cutting-edge formula made with 5 of the most powerful nootropics on the planet…which in clinical studies have been shown to improve memory, increase focus, boost motivation and even elevate mood. If you want to feel the power of unlocking your full brain potential, try the revolutionary cognitive-enhancer Cerastim today. 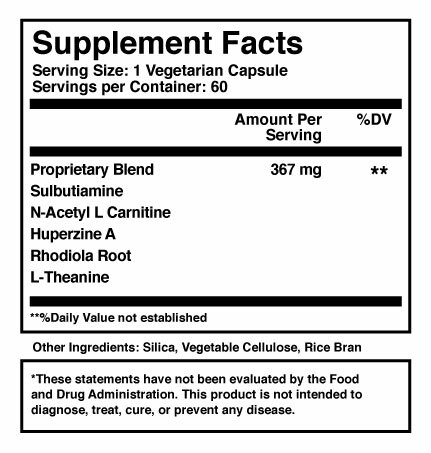 Cerastim comes in 450 mg vegetarian capsules. Take 1 or 2 capsules in the morning with a full glass of water and a meal. Cerastim is vegetarian, lactose-free and gluten-free. 1 bottle contains 60 vegetarian capsules. You get a 90 day money back guarantee. Cerastim is third party tested for safety and purity. What is Cerastim? How does it work? Cerastim is a breakthrough new supplement which can dramatically enhance your memory, focus and mood, as well as promote overall brain health. It is made of a combination of potent compounds which studies have shown to be effective at boosting the levels of neurotransmitters in your brain*. Neurotransmitters are chemicals that regulate your brain’s ability to function properly. As we age, our neurotransmitter production dwindles, and our memory and concentration begin to suffer. The ingredients in Cerastim have been found to support the brain’s natural ability to protect itself from age-related cognitive decline. Is Cerastim safe? Can I take it along with my other medications? Always consult your physician before taking any supplement. In most cases, Cerastim is safe. It is made from naturally occurring compounds extracted from plant or mineral sources. Like all Live Cell Research supplements, Cerastim is tested by an independent lab for safety and identity. Cerastim may cause nausea or stomach discomfort if taken on an empty stomach. We recommend you take Cerastim with food. Some users report that Cerastim keeps them awake when taking it in the afternoon. Does Cerastim work for everyone? The ingredients in Cerastim have been shown in clinical trials to be effective at improving memory, focus, and overall cognitive function. If you do not get the results you want, or if you are unsatisfied with Cerastim for any reason, simply return the unused portion within the first 90 days, and get a full, fast refund. You can even send back an empty bottle and we’ll still give you a 100% refund — no hassles, no questions asked. That’s how confident we are it will work for you. What are the ingredients in Cerastim? How do I use Cerastim? Simply take 1 or 2 capsules in the morning with a full glass of water and a meal. Some users report that Cerastim keeps them awake when taking it in the afternoon. 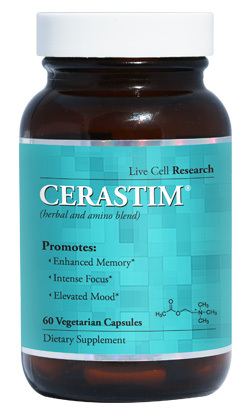 How is Cerastim different from other “brain-boosting” supplements? Many so-called “brain-boosters” are nothing more than caffeine or vitamin B12 pills, and contain no actual mental performance enhancers. Those that do contain real ingredients often do not have a strong enough dosage to get results. Worse, some of these pills are made by disreputable manufacturers who are known to slip in unregulated quantities of illegal pharmaceutical drugs into their supplements. With other products, you often have no idea what you’re getting. Cerastim uses only the most effective compounds, shown in clinical trials to be effective at promoting cognitive abilities. Each batch of Cerastim is tested for safety and potency by a 3rd party laboratory, ensuring its effectiveness, so you reap the maximum benefits. Who is Live Cell Research? Should I be worried about allergic reactions? Cerastim is gluten, lactose, and allergen-free and packaged in vegetarian capsules so they’re absolutely safe for consumption no matter what kind of dietary restrictions you may have. They contain no stimulants, no caffeine, and no synthetic or toxic agents. We ship Monday through Friday and always ship within 24 hours upon receiving your order. Shipping takes between 2 and 7 business days within the U.S., depending on your location. Try Cerastim™ RISK-FREE for 90 Days! This is, quite frankly, the one of most important investment you will make to the quality of your life and we want to make the decision easy for you. If you are not 100% satisfied with your purchase, we DON’T want your money! It’s as simple as that. If you do not experience renewed energy, sharper memory, and increased focus – among many other benefits – with Cerastim™, we want you to contact us for a full refund of your purchase price. There will be no questions asked and we will refund your money immediately. Click the link below to order and we will ship your purchase out immediately. You have 90 days to try Cerastim™ and see the results yourself. If you are not 100% satisfied, simply contact us and we will gladly refund your money. Your Privacy Is Our Number 1 Priority! Your transaction is secure. Using our secure server, your order information is transmitted using the latest SSL encryption technology to ensure complete and total privacy and security. The whole process takes just a few minutes and you'll receive your Cerastim™ package in just a few business days. Copyright © Live Cell Research, DBA . All Rights Reserved.